Once he finds someting that works for him, my father sticks with it. 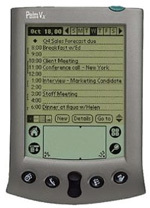 Which is why, until very recently, he was still using his Palm Pilot Vx. But all things come to an end, and now that he and Mom got His and Her’s Samsung Galaxy S‘s, it was time to get his contacts migrated from the Pilot to Gmail, so they could get picked up by the Android. This turned out to be less straight-forward and more challenging than anticipated. So, although I don’t expect many will need to run through this, I’m posting for the few who might. This’ll save you a couple of days of heartache.